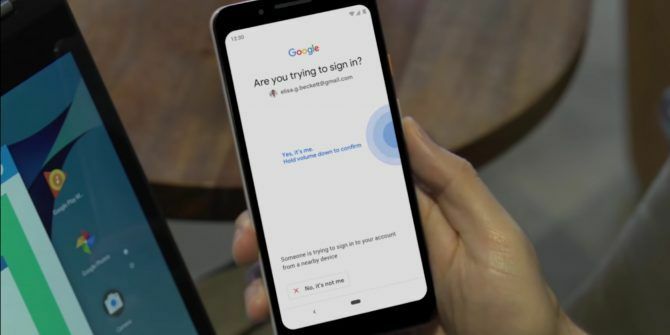 If you’re looking to protect your Google account from hackers, Google has a new 2FA trick up its sleeve. It involves using your Android handset as a security key, and it’s available to anyone who owns a device running Android 7.0 or later. Two-factor authentication What Is Two-Factor Authentication, And Why You Should Use It What Is Two-Factor Authentication, And Why You Should Use It Two-factor authentication (2FA) is a security method that requires two different ways of proving your identity. It is commonly used in everyday life. For example paying with a credit card not only requires the card,... Read More or two-step verification is a key weapon in a fight against phishing. As the name suggests, 2FA or 2SV adds an extra element to the login procedure. This makes it much harder, though not impossible, for hackers to sign into your accounts. 2FA usually involves being sent an SMS text message or employing an authentication app. However, you can also use physical security keys such as dongles. Google’s latest innovation means you can now use your Android handset as a physical security key. To use your phone as a security key all you need is handset running Android 7.0 or later, and a Bluetooth-enabled computer running Windows 10, macOS X, or Chrome OS. You must also be enrolled in Google two-step verification program. Sign into your account and turn on Bluetooth. Open Chrome on your computer and visit the Google Security page. Tap 2-Step Verification and click “Add Security Key”. Choose your phone from the list of available devices. If you’re using a Google Pixel 3 you’ll be able to activate the security key by pressing the volume-down button. All other eligible Android devices will need to sign in and tap a button. This currently only works for logging into Google services. For more detailed instructions, see this Google Support Note. This may seem overkill for personal accounts, but with the best hackers 10 of the World's Most Famous and Best Hackers (and Their Fascinating Stories) 10 of the World's Most Famous and Best Hackers (and Their Fascinating Stories) White-hat hackers versus black-hat hackers. Here are the best and most famous hackers in history and what they're doing today. Read More using sophisticated methods to bypass security efforts, it’s worth doing. It’s also surprisingly simple to set up, so if you have a phone running Android 7.0+ it’s worth considering. Explore more about: Android, Two-Factor Authentication. "If you’re looking to protect your Google account from hackers"
The problem is protecting your Google account from Google's prying.